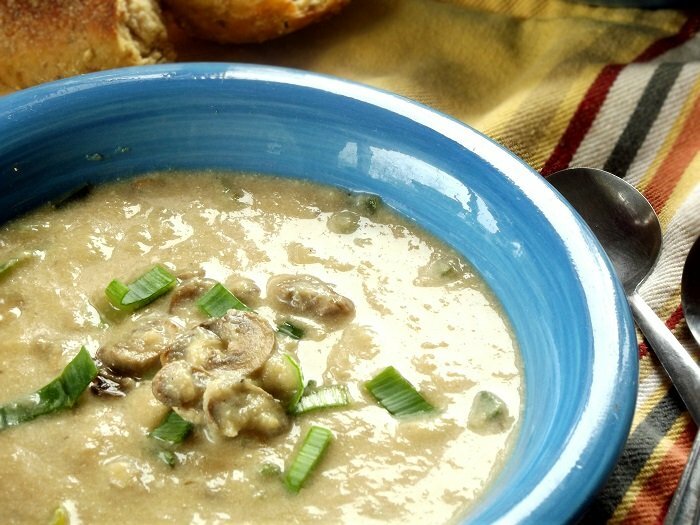 This cauliflower mushroom soup is made with a rich cauliflower base, seasoned with garlic, leeks and white wine, and loaded with tender sautéed mushrooms. Sheesh. I haven’t posted a soup recipe since last year. Time to change that! This soup was a fail-win. It exactly didn’t turn out in line with my original expectation (fail), but super delicious nonetheless (win), so I’m blogging it. 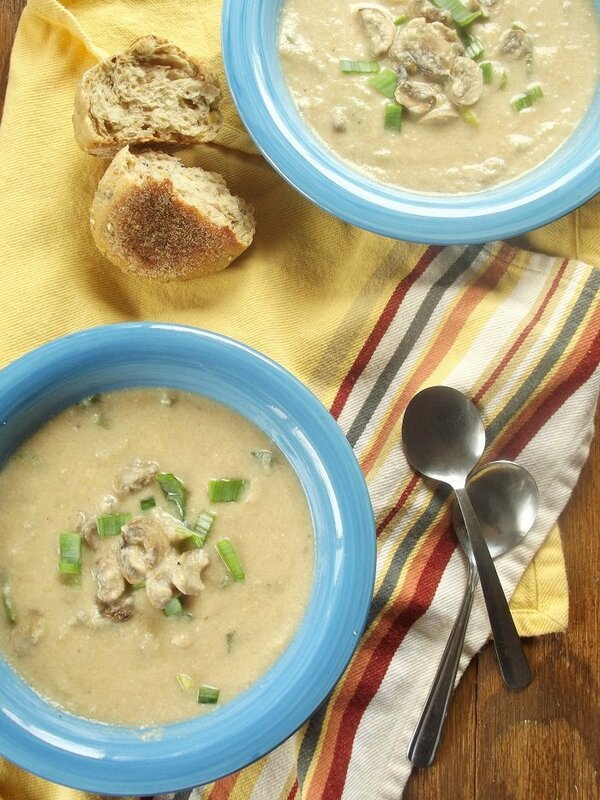 My original idea was to create a vegan cream of mushroom soup. That could have been really simple. Seriously, I made a vegan green bean casserole last November. 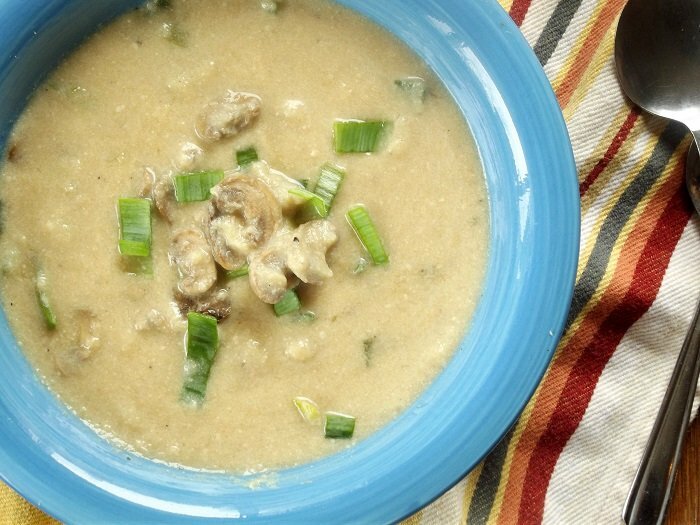 The main ingredient in conventional green bean casserole is cream of mushroom soup. I can say with some confidence as a result of that experience that the answer is as simple as soy or almond milk. I got it in my head though that I wanted something super rich and creamy, you know, to give heavy cream based soups a run for their money. I’ve done a few things along those lines lately using cashews, but I recognize that cashews don’t work for everyone’s diets, and I get lots of questions on substitutions from readers with nut allergies. With all that as background, the phenomenon of cauliflower Alfredo came to mind. Now, I’ve never had cauliflower Alfredo, but I know lots of folks swear by the stuff. I figured if cauliflower could replicate a heavy cream based pasta sauce, it’d have no problem with soup. I was right and wrong, and in hindsight, it kind of makes sense, given what I’ve heard about cauliflower Alfredo. The soup did not taste like cream of mushroom soup. It was creamy and mushroomy, and undoubtedly soupey, but cream of mushroom soup it was not. I guess I was a little bummed at first, but given the bowl licking, bread mopping, and my husband’s repeated exclamations of “I would never have known this was vegan!” I decided it was postworthy. This is a great soup for today – today being the first non-holiday day of the year when lots of us, myself included, are looking to de-cookie our diets and our bodies. 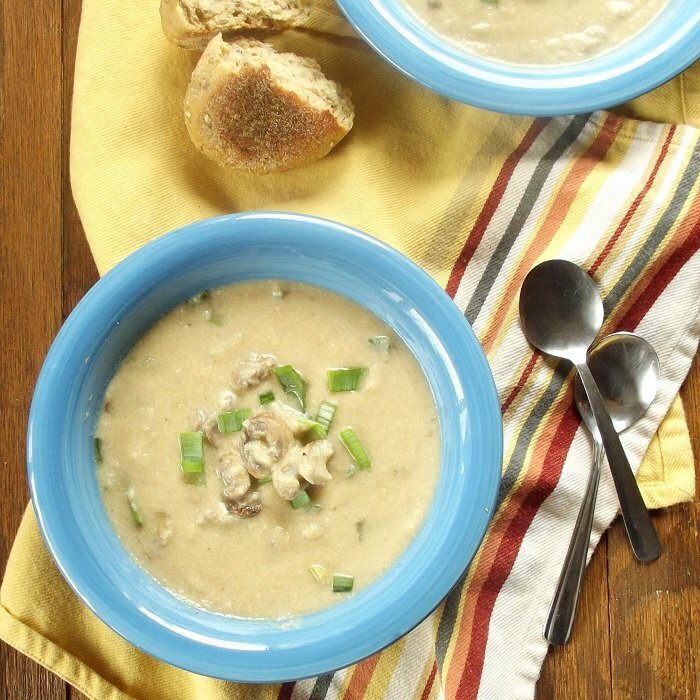 Despite its healthiness, this soup is rich and comforting. 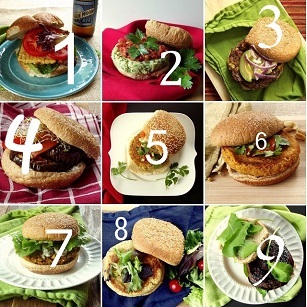 Cauliflower is one of those ingredients with lots of deceptively healthy potential. It’s hard to believe that a few short years back I probably would’ve called it boring and named it my least favorite vegetable. It’s now approaching the top of my list, which is pretty apparent to me based on my review of this month’s posting schedule. Get ready for some cauli in 2015, folks! 5 cups cauliflower florets about 1 lb. Coat the bottom of a large saucepan or Dutch oven with 1 tablespoon of olive oil. Place over medium heat. Add white parts of leeks and garlic. Sautée until leeks are softened, about 5 minutes. Add wine and raise heat to medium-high. Bring to a simmer, Allow to simmer, stirring occasionally, until reduced by half, about 5 minutes. Add broth and cauliflower. Bring back to a simmer and allow to cook until cauliflower is tender, about 10 minutes. While cauliflower simmers, coat a large skillet with remaining 1 tablespoon of olive oil and place over medium heat. Add mushrooms in as even a layer as you can get them and cook for 5, minutes, until lightly browned on bottoms. Gently flip and cook another 5 minutes on opposite sides. Remove from heat and transfer to a plate. Working in batches if needed, transfer cauliflower mixture to blender or food processor and blend until completely smooth. This may take a few minutes. Return to pot. Add milk, salt and pepper to cauliflower mixture. Place over medium-high heat and cook just until heated throughout. Stir in mushrooms and green parts of leeks. Maybe increase the garlic and add a dried chili to the leeks? I would increase the spices for sure. Ha! I thought that was a good idea so whipped off the top of the Worcester sauce and accidentally poured about 1/3 cup in the soup! Quickly scooped out a bunch so hope it’s still ok. Doh! picture links are broken. I’d love to see them.